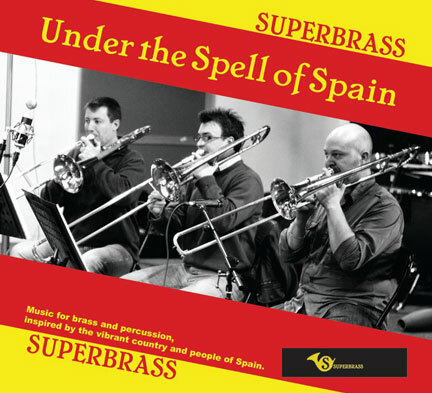 Under the Spell of Spain is the debut recording from Superbrass, an ensemble comprising some of the finest brass and percussion players working in the diverse London music scene. The recording is a deliberate and eclectic mix of original and arranged music for brass and percussion, all inspired by the vibrant country and people of Spain. This recording is available through Amazon, I-Tunes and a host of good music shops and record shops around the world. "I think this is undoubtedly one of the finest brass ensemble recordings that has ever come my way. I'd recommend this outstanding album to anyone who wants to hear some of the very best of London's brass and percussion players in exciting, new 'Spanish-flavoured' repertoire." "Fantastic playing in all departments plus careful editing gives a clear picture of the quality of London brass playing in 2011. Brilliant technique and superb artistry from all concerned. Some really fine new compositions." "Wow! what a great CD. The playing is superb and a fantastic programme gives the star studded line-up a real vehicle to show their talents to the absolute full." "Under the Spell of Spain is a showcase of virtuosic playing by some of London's finest brass and percussion players. As expected in Spanish-flavoured brass ensemble music, the demands placed on the trumpet section are particularly extreme, but this star-studded section carries off these parts with true finesse and flair. The album also contains some of the best plunger solos you'll ever hear! Highly recommended!"? Trombones, baritone, euphonium, bass and contrabass trombone:?